These gorgeous Floral Baby Milestone Cards help to capture those special moments in your little one’s first year. A beautiful keepsake way to record and remember those precious first moments. 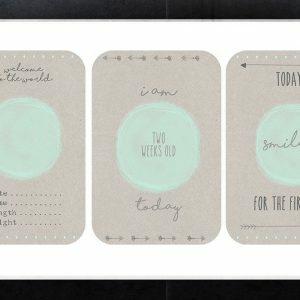 When your little one has achieved a milestone or reached an anniversary, you simply take a photo of them with the appropriate milestone card beside them and write the date on the card (where necessary). 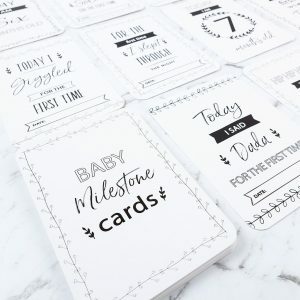 These floral milestone cards are designed and made right here in New Zealand by Autumn Avenue The Label (formerly Bibs and Bunting), so you’re also supporting a small New Zealand business and their dream. 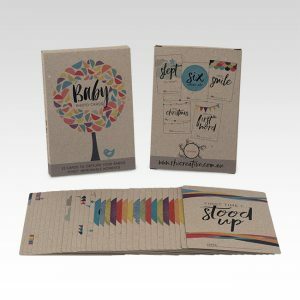 Gorgeously presented in a gift box they make the perfect baby shower gift or a gift for a new mum. Presented in a kraft box. Baby images credit – Jo G: Please do not reuse. We also have a fantastic range of baby memory books to record your little ones memories, milestones and firsts. Are you on social media ?